Stinson, Dr. David Arnold, 92, died at home in Ohio, Antigonish County, surrounded by loved ones, on November 5, 2017. Born on September 25, 1925, to Marguerite Coles and Arnold Stinson, in Toronto, Ontario, David led a full life. In his youth, he attended University of Toronto Schools, and spent summers working at the family lumber mill and as a farmhand. During WWII, David joined the Royal Canadian Navy and served as an able seaman in the North Atlantic. After the war he attended medical school at the University of Toronto and graduated with honours in 1949. He then completed his masters in Biophysics at McGill University in Montreal, where he met his first wife Anna Cichanowicz. Returning to Toronto, he specialized in Cardiology and was the chief of Outpatient and Emergency Department services at the Toronto General Hospital. During his time in Toronto he was also an Associate Professor of Medicine at the University of Toronto, Vice President of the Royal Canadian Institute, President of the University of Toronto Medical Alumni, and the physician-in-chief of the Runnymede Hospital. In 1969, he took an interest in Zen Buddhism, studying under Suzuki Roshi. Subsequently, he studied Tibetan Buddhism with Choyam Trumpa Rimpoche and helped to establish the first Dharmadatu in Toronto. He met his second wife, Janey Humphreys, at a retreat and they moved to Antigonish, Nova Scotia in 1984. Settling in the Ohio Valley, he followed his dream of being a farmer- herding goats and growing vegetables. He started a holistic medical practice and was a Shambala meditation instructor in Antigonish. Common threads through David’s life were a love of people, nature, water, art, and music. His curiosity and passionate interest in people and their stories made him an astute diagnostician. The joy he took in meeting new people and forming friendships made his home a place where all were welcome - practitioners, artists, friends, animals, foreigners, and neighbours alike. 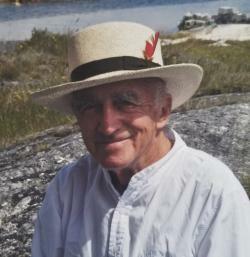 He was drawn to water, sailing out of the Royal Canadian Yacht Club, swimming and canoeing at Red Pine (Haliburton, Ontario), and later, walking the beaches of Nova Scotia. Inspired by nature and his Buddhist practice, his focus in art changed from landscape sketches and watercolours, to performance art in the 1970s, and then to a practice of zen calligraphy. From his childhood singing as a choir boy at the St. Thomas Anglican Church, he continued delight in music and embraced the musical tradition of Nova Scotia, playing the bourdon. In his later years, he would sit by the fire in his cabin overlooking the garden, meditate, read, write, listen to music, and take joy in the people around him. With his passing, we celebrate a brilliant and caring physician, teacher, father, storyteller, and World War II veteran. David is survived by his sister, Mary Watt; his children, Johanna, Michael, Trevor, Frederick, Julie, and Laura Stinson; his grandchildren, Jeremy Lee, Jordan Stinson, Laura Stinson, Noah Cassidy-Stinson, Hannah Bates; his nieces and nephews, Kathy Morrison, David Stinson, and Peter, John and Robert Watt. He was predeceased by his brother, Fred Stinson; nephew, George Stinson; and grandsons, Forest Priestley and Zoe Cassidy. David was buried in St.Joseph’s Cemetery, Antigonish, NS on November 6th, 2017. A Celebration of Life will be held at St. Joseph’s Lakeside Community Centre on Saturday, November 11, at 3 pm.